What Is SIM Swap Fraud? 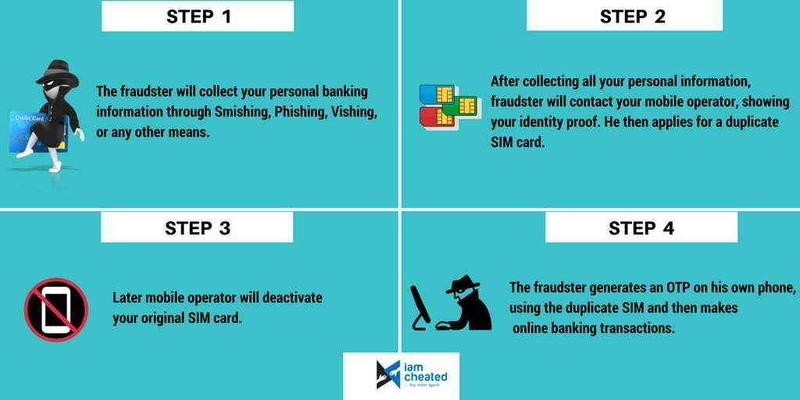 Under SIM Swap fraud, the fraudster will first collect your personal banking information through Smishing, Phishing, Vishing or any other means. Under smishing, you receive an SMS with a web link. If this link is clicked, a malicious program causing theft of data will be downloaded. Phishing means collecting customers information by sending fake emails. Vishing refers to calling a customer by posing as a bank executive to collect private information. After collecting all your personal information, the fraudster will contact your mobile operator, showing your identity proof saying the original SIM is lost. He then applies for a duplicate SIM card. The mobile operator would de-activate your SIM card. The fraudster generates an OTP on his own phone, using the duplicate SIM and then makes online banking transactions. Since your original SIM will be de-activated, you will be unaware of the fraudulent transactions he makes. How to protect yourself from SIM swap fraud? 1. Contact your mobile service provider as soon as possible, if your phone goes out of service all of a sudden. 2. Register for email alerts to stay informed on your bank account transactions. 3. Monitor your bank account and credit card statements regularly. If you find any suspicious transactions, report it to your bank immediately. 4. Don't share your personal information such as Credit/Debit Card number, expiry date and CVV number with unknown persons over e-mail, calls or SMS.